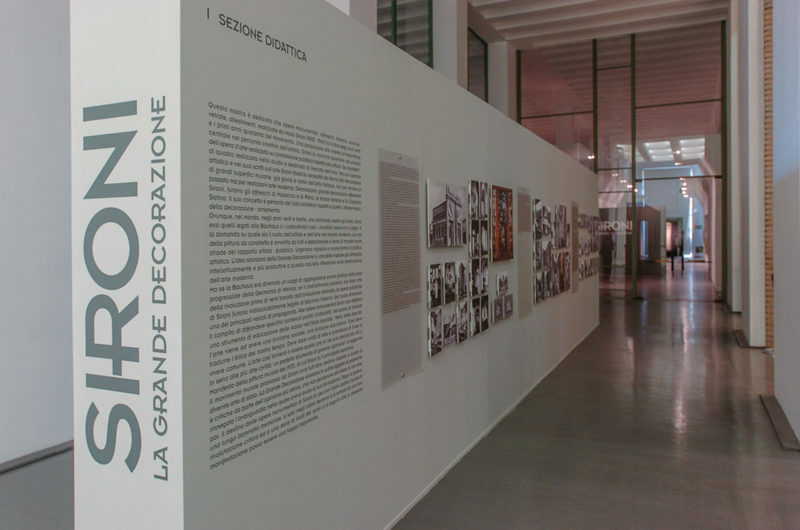 The exhibition is curated by Andrea Sironi and it is dedicated to monumental pieces, frescoes, mosaics, sculptures, windows, exhibitions made by the artist between the last years of the 20s and the first years of 40s. The exhibition starts in the lobby of the Triennale museum, where a long septum that hosts the dedicated section, drives the visitor up to the entrance. We find a second septum entering the gallery, which is placed diagonally respecting the prospective, with a slight embrasure that frames the background caryatids. In this way, we can see the presence of this masterpiece in the middle of our visit. In the first rooms the section “studies and sketches” has been placed that presents a large number of small pieces arranged in different levels. Room after room the works become less frequent and increase in size, in an increasing that has its pick at the central room of 400mq., where we can enjoy the cardboard for “the corporate Italy”. Here the oversized carton boxes, taller than 3 meters, are emphasized with the exhibition system that has been designed. The works, illuminated with spot light shapers that leave the rest of the environment dark, are exposed on lightweight metallic frames, outdistancing the frames from the walls and creating the illusion that are floating in the air.